Home > Fire Safety & EMS > Fire Safety Evacuation Supplies & Tools > Fire Extinguisher Arrow Signs > Glow In the Dark "Fire Extinguisher" Label - Vinyl Self-Adhesive - 6" x 1"
Home > Fire Safety & EMS > Fire Extinguisher Arrow Signs > Glow In the Dark "Fire Extinguisher" Label - Vinyl Self-Adhesive - 6" x 1"
Home > Fire Extinguisher Arrow Signs > Glow In the Dark "Fire Extinguisher" Label - Vinyl Self-Adhesive - 6" x 1"
Glow In the Dark "Fire Extinguisher" Label - Vinyl Self-Adhesive - 6" x 1"
These phosphorescent glow in the dark 6" x 1" labels clearly stating "Fire Extinguisher" will help identify extinguishers when the power goes out. 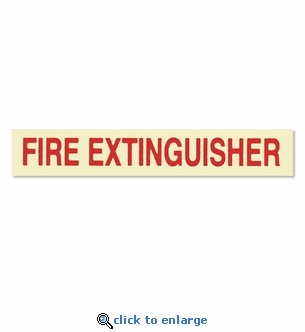 Energized by ambient light these adhesive vinyl glow in the dark labels will ensure your fire extinguishers are easy to locate in the event of a power loss or fire emergency. Use on extinguishers and cabinets. The phosphorescent material is charged by common light sources such as daylight, tungsten filament and fluorescent lights. When exposed to ambient light source, the label will charge the phosphorescent material to glow for up to 8 hours. Charges with ambient light source. Illuminates the instant power fails. Makes fire extinguishers easy to find. Phosphorescent material does not "wear out" from cycling light to dark. Phosphorescent material is non-radioactive and non-toxic. Not for use in areas without an ambient light source.